When you have a pet emergency, what do you do? If it’s outside of business hours, you may not be able to get ahold of your primary care veterinarian. Plus, most vet offices are closed at night. Thankfully, Veterinary Specialty Center of Seattle is here for your pet when they need care. We are open and staffed with doctors 24 hours a day, 7 days a week. This means that we are prepared and able to care for your pets with comprehensive, high-quality emergency and critical care when minutes count. Our staff of veterinarians boasts advanced training, and we have sophisticated equipment. All of this ensures a fast diagnosis and effective treatment for your pet. While is not necessary for you to call before your emergency visit, it may be a good idea to do so. This way, we can prepare for your arrival and make sure we do everything we can to care for your cat or dog. If you think your pet has ingested something poisonous, please bring the item with you if possible so that we can see exactly what it is. Pets are seen depending on how severe their condition is and on a first-come, first-served basis. Other pets may require immediate attention, even if you arrive first. We appreciate your patience as we know your time is valuable. 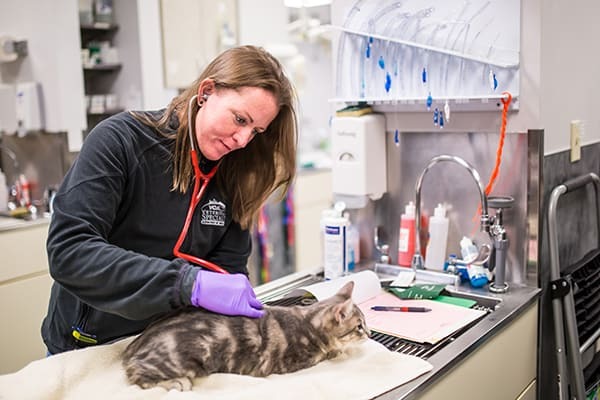 At Veterinary Specialty Center of Seattle, your family can trust that our veterinarians and technicians have extensive experience in emergency medicine. We have an emergency veterinarian and support staff on site 24 hours a day, every day. Our experienced veterinarians have the skills to provide exemplary veterinary emergency and critical care services for your pet. Our 24 hour emergency vet services are open to serve you and your pet. There’s no need to call ahead; however, feel free to do so in order to allow our team time to prepare for your pet’s arrival and provide the necessary care in a timely manner.